MIKE SMALLBONES support Would you consider joining Mike's support group? Anyone involved in Christian ministry will know that MIKE SMALLBONES support is a vital part of the Scripture Union ministry to the children of Africa. Airfares, salaries and the rent on homes do not grow on trees! Nor do they fall like manna from heaven ... but from our purses. Without the vital support of Christian friends and those who would consider themselves co-workers in the ministry of Scripture Union, Mike Smallbones's ministry would grind abruptly to a halt. Every cent that you give goes directly to Mike's work. 100%. There are no overheads as occurs in many NGOs where 60% of the money donated never leaves the shores of where it's given. Overheads swallow it up. 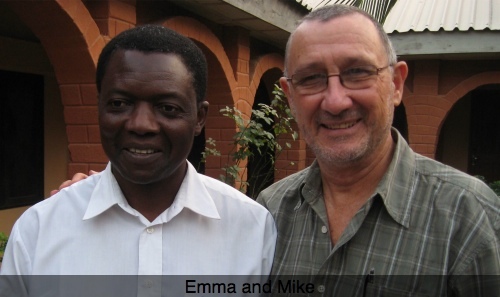 Further, Mike's long creditability over forty years ministry has built up a strong core of supporters. I say strong. Reasonably strong. Mike has not had a salary increase for SEVEN years. At 10% inflation, that means the buying power of his salary has in the last seven years halved. Thus Scripture Union has only been able to pay two-thirds of the amount that they have budgeted for his salary. A poor reflection I think you will agree on the devoted, distinguished, and without-flaw ministry of a man nearing retirement. "Remember this: Whoever sows sparingly will also reap sparingly, and whoever sows generously will also reap generously. THE LORD LOVES A CHEERFUL GIVER." This is not the place for a treatise on the blessing of tithing, but what I would like to say that 200 Christians paying only one month's tithe per year, would pay for the whole of this vital ministry. 200 tithes @ $200 per year = $40 000. Would you consider joining this band of happy people contributing to Mike Smallbones support? For the children of Africa? For Jesus? BEE UNDER THE MITRE, a short story about TITHING. This site is not intended to diagnose, treat, cure or manage any condition. Use your own good judgement and when in doubt consult your chiropractor.